Nicio in fencing three years ago because he likes strong emotions, physical confrontation and get your hands dirty without losing the style. The contact is the objective, a touch, a touch, the sound of the foil tearing the opponent’s fabric, the concentrated view, the senses profiled in a patient waiting, the exact moment, the perfect lunge. 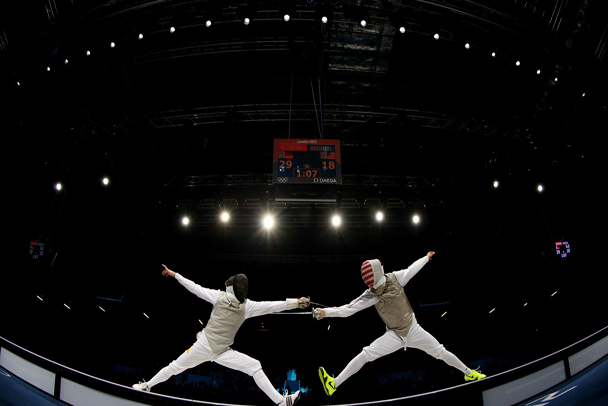 Fencing is a sport that along with activities like football and box goes unnoticed, but it captures the attention in events of a less inclusive scope and particular, select competitions. A sport that purifies the restless and with the passage of time, perfects the patients and fast. The sun on the forehead, a light fresh wind and a pile of suitcases. A teenage girl sitting with her legs on the steel bench in sportswear that rests inadvertently, receives with a casual kiss on the cheek to another. The unusual suitcases with a long compartment conceal a weapon of the seventeenth century. Still others come up to greet and a heated teenage girl sits down next to Lydia to suffer the harsh rays of the sun with no more gesture of annoyance. They talk quietly and wait, as at any other time, for the teacher to arrive. All backpacks remain a pile on the ground that is familiar to them. Seated in the concrete the smallest, they shield themselves from the direct contact of the sun without problems. A few steps in the area and cars arrive, one after another, from where children and adults alike descend; Enter and exit athletes through the door of the premises, cross a corridor between a security booth and a white table with two guards who carefully review backpacks suspected of storing a threat, although the swords here are no threat. At least the ten sabers and swords stacked in the sun, next to Lydia Casillas Cordero, no. The 15-year-old fencer who prepares for the Baja California High Performance Center represents calm and victory: two gold medals and one silver medal. Lydia is one of the champions who have taken to Baja California to be called the machine of fencing, when obtaining 21 gold medals in the National Olympiad that was celebrated this year in Puebla. Athletes pass showing their badge and continue to the facilities that reserve the right to show, except on special occasions. It happens that in the Center of High Performance, as in all high-performance centers in the country, there is no access for adverse sports. The majority passes by throwing critical glances at others, especially those who are not dressed in sportswear. They show an air of arrogance and security. They judge perhaps the disinterest for health. Cyclists and runners pass; Well formed bodies pass through the pavement, strong and light, trained to perform activities requiring millimeter precision. They go wrapped in plastic fabrics with familiar logos and looks that evoke lines like “just do it” and “nothing is impossible”. They pass by showing a disagreement between the people who enter and the slightly overweight who wait in the entrance, dressed in heels or formal shirts, counting the minutes so that those who wait leave. They pass while they are left behind until they are lost in sight. The continuous and enormous white fence that separates athletes from civilian-clad subjects and that surrounds the terrain does not seem to impose itself or present a challenge for the athletes it protects. The high fronts of people who have honorable medals to prove their worth. Impeccable scenery between cement and grass that do not vary in their gray and green tonality and that fill of energy next to the primary colors that adorn the structures only distracted by the voices that remain in constant agitation and the cars that circulate without stop by the university circuit . Finally I approach the teenager who refuses to go through a reason that she does not share with her peers: wait quietly someone, me. Fencing is a non-popular contact sport in Mexico. As unusual as carrying a foil in the streets in the twenty-first century, as subtle as fighting with one hand and as swift as a good thrust. As the history of the International Fencing Federation says, sport “is as old as history itself.” Their antecedents come from the Egyptians who fought with sticks, later the Greeks with lethal arms and the Romans with swords and shields that taught the technique of the combat. If every culture exercised its strength or its defense with blood, the weapons and the fencing proved to be the ones that evolved the most. In courts where sports are practiced it is common to hear a phrase that becomes sentence: “to play without being touched”. If the fights were made in the open field, today the fighters have a corridor two meters wide and the possibility of moving forward and back. The attack has a limit, and is 14 meters long. There are three types of weapon: saber, sword and foil. The combat is essentially the same, but the difference lies in technical details. The saber is moderately heavy and with it the valid contact zone is from the waist upwards. The sword is heavy and requires more strength in the arms to handle it but the area of contact is the whole body. Lydia uses the foil, a weapon of a light and manageable character that only has as contact zone the torso. The foil is the weapon most associated with fencing: a thin metal line barely visible to the eye during the runs. The voice of the seated teenager shakes. A smile opens, full of emotion and restless repeating phrases. “You need good reflexes and a lot of concentration.” Good reflexes and lots of tension. Keep calm but keep the tension. Tension. Tension. “It’s best to set aside the voices of spirit that scream from the stands, concentrate on the opposite and observe. And we must know how to defend ourselves to attack. Keep calm, an unbreakable temper, an unusual speed that allows you to see in slow motion the attack that rushes on you and contain it. Breathe and look for the gap, focus, a flicker and stake the foil on the fighter’s chest. An impeccable counterattack. Lydia is very small, with brown skin and thin complexion. She has her hair pulled up with an elastic band, and she remains on the bench, covering herself uselessly with the rays of the sun with her small, not so delicate hands. It has a strong character that makes note with each word. It maintains a simple but concise conversation. Now the vocabulary you use reflects a sense of relaxation as you respond to the questions. He likes travel and fencing has been given. “A secondary advantage, but nice. He likes to know the world when he competes, to take his bags, to pass through the cargo area with the inevitable and occasionally funny interrogations of the policemen upon seeing the foil, “Who is going to compete, you? So small?”. Yes. The little girl beat Guadalajara in the last Olympics, pushing her opponent with precise and aggressive movements, even though she was overcome in height and stride, not caring about the cries of support against her and without being intimidated by the touches against. Attacking without allowing response, intense but keeping your feet in combat, eyes open. Lydia is not like today with a hand on her forehead, covering the sun. It is covered with the white armor of thick cloth and its metallic mesh mask that does not allow to see its face, the white glove that prevents the metal of the grip slides in the sweat of the hand, a dark jacket full of electronic sensors that They do not allow lying to the fencers. Finally return to the temperate climate of Puebla, the beaches of Cancun full of white sand and warm waters and then counterposes a trip through Europe. The impressive cold of Moscow, the trees of Germany and Hungary, the history of Italy and the skies of Poland, each place more impressive than the previous one. “It’s a lot of effort, but it’s worth it, it has many rewards. I close my notebook and she gets up. He takes his backpack off the ground, says goodbye and walks toward the door to a training session, to another fight.